WTF President Chungwon Choue delivers a speech during the opening ceremony of the 1st WTF World Taekwondo Team Championships at the Hua Mark Indoor Stadium in Bangkok , Thailand on Sept. 14, 2006. BANGKOK, Thailand — The 1st WTF World Cup Taekwondo Team Championships kicked off for a five-day run here on Sept. 14, 2006, drawing over 300 athletes from 35 countries. The event, which takes place at the 5,000-seat Hua Mark Indoor Stadium, features individual and team competitions. The individual competition is scheduled to continue until Sept. 17, with the team event on Sept. 18. Based on the individual competition results, eight countries will field their respective athletes in the male and female divisions for the team event. "Now, we are introducing an event that combines individual brilliance and team effort in the sport of taekwondo. It will be interesting to see how our athletes and global taekwondo family respond to this new system," said WTF President Chungwon Choue during the opening ceremony of the 2006 Bangkok World Cup. Dr. Choue said, "The inaugural World Cup Taekwondo Team Championships are a momentous step in the global renaissance of taekwondo." "Other than the Olympic discipline of kyorugi, we have introduced another taekwondo discipline, poomsae, at the 1st WTF World Taekwondo Poomsae Championships held in Seoul on Sept. 4-6." He continued to say, "Taking this opportunity, I would like to inform everyone that only the best referees of the WTF will be selected to officiate at the 2008 Beijing Olympic Games." "It will be a great incentive for our referees to do their utmost to ensure top-class officiating standards at the World Cup Team Championships." For Thailand, the year 2006 is a special year as this year marks the 60th anniversary of the accession to the throne of His Majesty, King Bhumibol Adulyadej of Thailand. During the opening ceremony, WTF President Choue presented a replica of ancient Korean crown to Thai Deputy Prime Minister Suwat Liptapanlop, which was then handed over to Mr. Pimol Srivikorn, chairman of the Organizing Committee of the championships. The crown from the Silla Dynasty of Korea is to be presented to His Majesty King Bhumibol. Dr. Choue presented an honorary Dan certificate to the deputy prime minister. 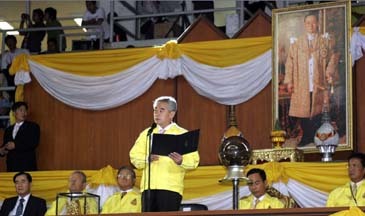 The opening ceremony featured cultural performances from four regions of Thailand, followed by a puppet theater show to mark the 60th anniversary of the King's accession to the throne. There was also a Korean taekwondo demonstration under the sponsorship of Samsung at the end of the opening ceremony. Samsung, the global partner of the WTF, sponsored this inaugural World Cup Taekwondo Team Championships.